I modified the hat so it fits a bit better. 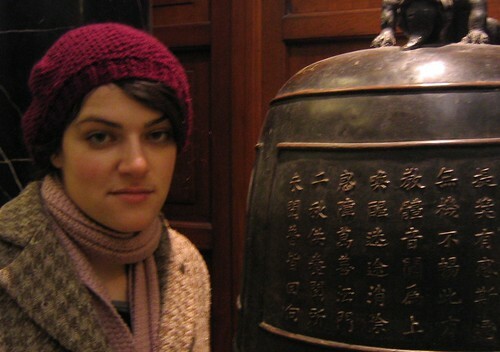 As proof, above is a photo of me wearing it yesterday, sitting by a load of giant bells at the British Museum (my last name is Bell...). You'll have to excuse the dark shadows and slightly dazed look, I was a bit off colour over the weekend and not sleeping that well. I frogged it down a good couple of inches. The patten says to work for six inches before starting the crown decreases, but in this version there is a bit under four. It's still slouchy enough for me to tuck my hair inside, if the mood so takes me (useful when it's windy). Firstly, thanks for the comments on my recent posts. Moving to bloggerbeta makes it harder to reply to people. I realised google had changed my settings; I needed to re-tick the box letting them show my email EDIT: on my profile page (so that when I comment people can reply). I'm not going to post a pattern of the voodoo doll - it's just two spheres and four tubes! The heart used a very simple chart, anyone who can do intarsia can work out how to write one themself. As for any doll, its advisable to work a tight gauge, I did two strands held together for thickness. 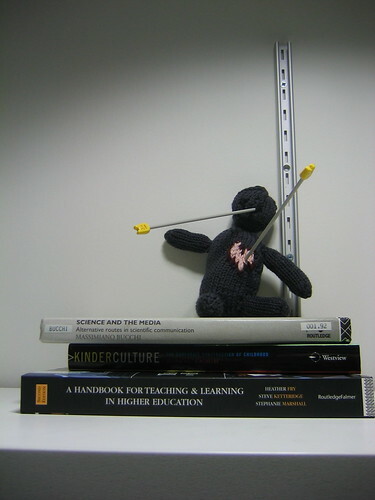 If you still want guidance, there is a really great voodoo doll pattern here. Anyway, I finished something. A hat. Do you think, maybe, it might just be a bit big? I know it's meant to be slouchy, but it's not quite the look I was hoping for (even when I wear it properly). I think the problem is more likely the yarn than the pattern. It's cashmerino and has a bit too much drape. A strong woolen tweed would do a lot better, but it would have scratched my forehead. I'm going to try wearing a bit more this week, maybe I just need to find the right way for it to hang. I love the colour and the seed stitch at this tension, even if it is a bit too drapy. If that doesn't work out I'll frog it down a few inches. 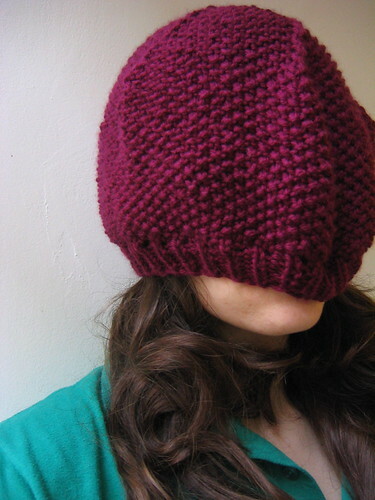 As the designer says, it's basically an elongated beret. So I can try de-elongating it a tad. 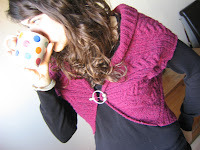 I hate re-knitting with cashmerino thoug - too fluffy and cotton wool like. EDIT: I've added tags to the photos in Flickr to show what yarns/ stitches I used. Just click on the images to be taken to their Flickr page. On tuesday, I went to the London SnB meeting in the basement coffee shop at Piccadilly Waterstone's. I like talking to other knitters, I love knitflicks (on this saturday) but I'm yet to find a knitting group I go to regularly. I have trouble doing anything "regularly", my routine is too confused. Plus, although I like the feeling of knit-community, I get a lot of that online. I went to this SnB partly to try out a new group, but also because I wanted to deliver the pieces of scarf I'd been making (pictured). I posted about this project last month. The ladies behind the London SnB are aiming to knit four 200 foot scarves for the Lions in Trafalgar Square, all in aid of cancer research. I did about 6-7 pieces, all from scraps in my stash. You can't see all of them because I may develop the stitch pattern into designs. 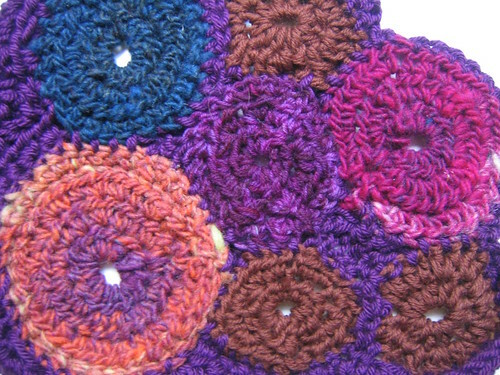 My favourite section, however, is a very simple bit of freeform crochet (pictured below) - isn't the blue/green hypnotic? (a bit of kureyon left from my lost hat). The most amazing thing about this SnB is its size. As in a good 20-30 people, maybe more. I've been to knitting groups where I was the only person to turn up, I'm used to there only being 3 people, maybe 5 if we're lucky. I went in, saw a small table of knitters with a couple of empty seats and even someone I know from a non-knitting context. After I put my bag down I looked up, and realised this was only one of four large tables of knitters. I was surrounded! More people came after me, we extended our table and took over another. I'll try to go back, like iknit (another I keep meaning to try...) they change location every week. But they also change day, which might fit my lack-of-routine. 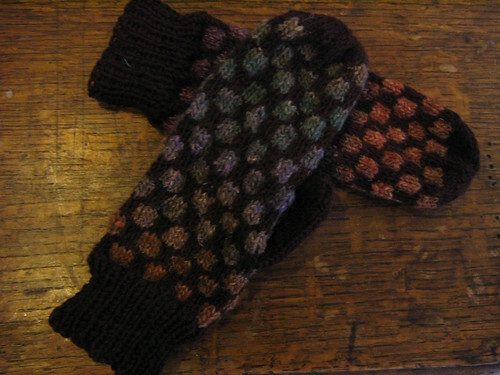 You can track the scarf's progress at their blog and sponsor it by clicking here. Everyone donating money is entered into a prize draw to win one of the scarves. 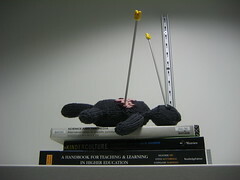 Presenting the voodoo doll. Complete with smiley-faced needles for pins. I'm especially proud of the intarsia heart - most of it's done in 4ply (two strands held together, for thickness of doll-skin) but the light pink is dk, so it really pops out. I made it because I was incensed by my grant being over a month late (I should get it by the end of this week). It's not one person's fault. It's not even, really, several people's fault. None of those involved did anything other than what they thought was right. But the systems are badly thought out, with a shocking lack of understanding between organisations. This is a large part of why it was quite so frustrating; I couldn't focus my rage on a particular person but had to wade through layers of mistake-ridden bureaucracy (please note, if it had been one person's fault I wouldn't have stuck pins in them, just written a letter or ranted about them to my friends). Hence the voodoo doll. It lets me materialise these systems and cultures and layers and layers and layers of mess-ups into one small, single entity who fits in my pocket. Better than that, it's anthropomorphised. It has a face, eyes and heart, all of which I can stick a needle through. Please insert bitter and evil laugh here. I tend to get my news from the internet, but there is something wonderful about a physical copy of the Weekend Guardian. In my defense, it lasts two of us (sometimes more) at least a week. The excessive piles of paper get used. Today was a good Guardian day. I knew it would be before I even got my hands on a copy. There had been some animated post's on a few online communities this morning. Crafters were excited about the 90 page booklet linked to this book: make a doormat out of clothes pegs, turn an old roll-neck jumper into a hotwaterbottle cover! Academics have been delighting in reading the guilty pleasures of notable clever-cloggs: Steve Jones has a thing about estate agents, Elaine Showalter loves Trinny and Susannah! I've got a horrid cold and had just a rubbish day yesterday. The short version is that I discovered it is going to be yet another week before my grant comes through - that's over a month waiting for my pay. So, feeling in need of some self-indulgence but also feeling pretty poor and full of the cold, I pulled on my new mittens* and went down to the shops in search of vitamin C and the newspaper. 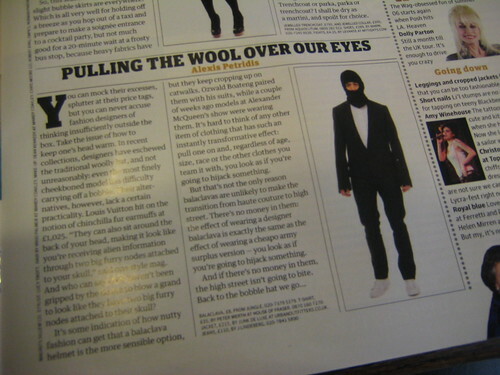 Aside from the sections on craft and academic gossip, the true delight of today's paper was discovering that the balaclava has been big on the catwalks (see picture at top of post). A prediction I made here months ago. 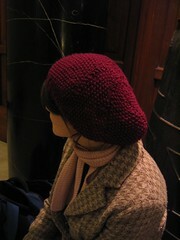 Though I should note that the article comes out in favour of the bobble hat. So this (highly frustrated) academic is sitting hiding in her college hoodie, slowly burying herself in tissues, about to spend the afternoon with her own guilty pleasures. I have the pile of weekend newsprint to get through, a cheesy musical on the telly and my knitting. 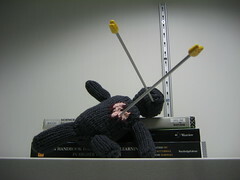 I'm making a voodoo doll to focus my grant-rage upon. Expect a pin-filled FO post sometime next week. * Yes, new mittens. A secret FO hidden in my cold-addled rambling post. It's based on this pattern (which I found through Mettetations), though I made them more chequered than honeycomb. I used brown Opal Uni (two strands held together) with Noro silk garden for the MC, knit tightly on a 3mm circular. It was cold and I couldn't wait for the Anemoi's to be done so whipped them up on the bus to and from work this week.